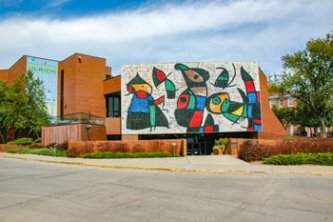 As the region's source for modern and contemporary art, the Ulrich Museum of Art at Wichita State University connects viewers with artists and artworks that reflect our world today. Visitors can explore and enjoy 20th- and 21st-century art with exhibitions that feature emerging and established artists works from our permanent collection, and traveling exhibitions. The WSU campus is home to the Ulrich Museum's renowned Martin H. Bush Outdoor Sculpture Collection, rated one of the top collections of its kind by Public Art Review. The museum holds a permanent collection of more than 6,700 works by such artists as Benny Andrews, Diane Arbus, Helen Frankenthaler, Zhang Huan, Jacob Lawrence, Joan Mitchell, Robert Motherwell, Rodney McMillian, Gordon Parks, W. Eugene Smith, Kara Walker, and Andy Warhol. The galleries are open Tuesday through Friday 11 a.m. to 5 p.m., and weekends 1 p.m. to 5 p.m. Closed Mondays and major/university holidays. The Outdoor Sculpture Collection is always open. Admission, parking, and group tours are FREE.